I found some frozen wild caught Mahi Mahi fillets at Costco recently for a really great price! If you don't mind buying frozen (I don't) and you don't feel like breaking the bank on salmon or wild shrimp- give Mahi Mahi a shot. It has a really light, non-fishy flavor that can fit in with pretty much any flavor profile. It's also really hearty & easy to cook on the stovetop. 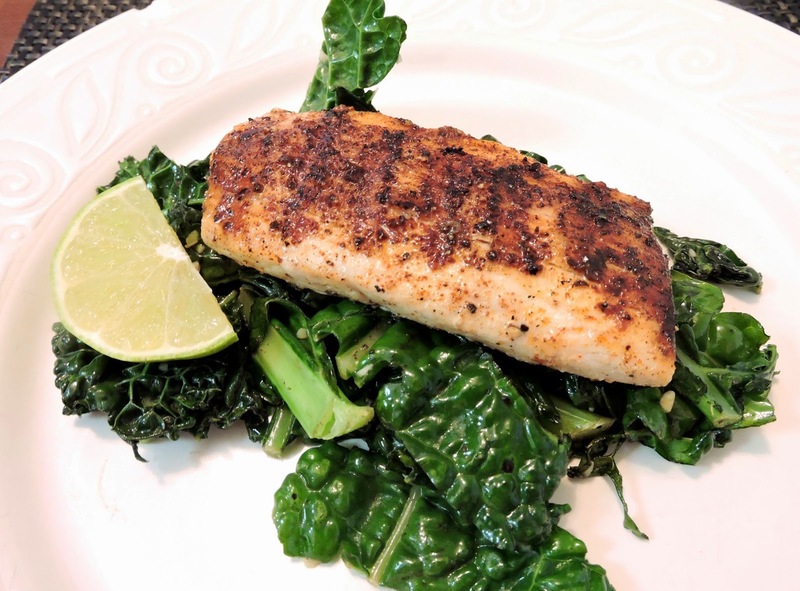 Here's my recipe for a simple Mahi Mahi that's lightly seasoned & grilled to perfection. *Coconut oil is great too! 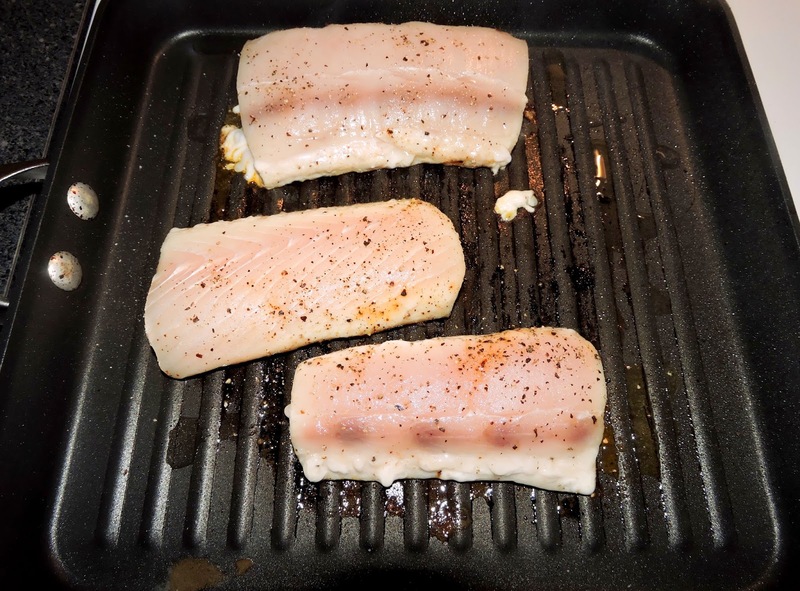 Lay the fillets out on a flat surface (I use a cutting board), and sprinkle them with a light, even coating of paprika, garlic powder, salt, & pepper. Pat the spices in to help them stick. Heat a grill pan on the stove to medium high heat, and drizzle with avocado oil. 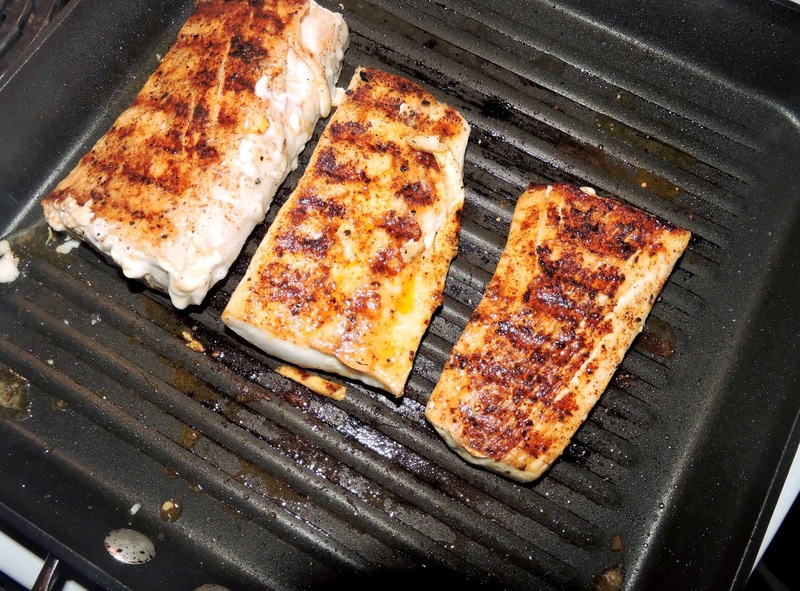 Place the fillets onto the grill pan- seasoned side down. Sprinkle spices onto the second side of the fish while they cook. Cook for 5-6 minutes, or until the fish is cooked about 1/2 way through & looks browned on the bottom side. Flip the fillets using a large spatula or tongs, and continue cooking for about 3 minutes (the fish will feel slightly firm to the touch once it's cooked through). Serve with cauliflower rice or veggies of your choice! I love this cast iron pan it comes in a really nice package, and it is good quality. I have used it about five times, and it is still going strong. I put it in the oven and cook with it on the stove top. This is my first cast iron pan of any sort and I really like how they include instructions on how to care for the pan.